Iraq is battling to retake the city of Fallujah from Islamic State militants. On Friday, Iraqi forces took control of the city's municipal building, but clashes are still ongoing. 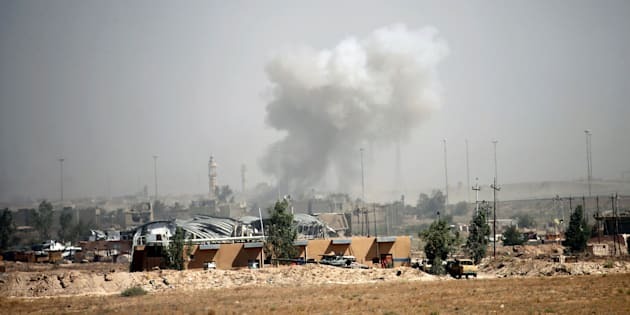 FALLUJAH/BAGHDAD, Iraq (Reuters) - Iraqi forces on Friday entered the center of Fallujah, theIraqi city longest held by Islamic State, nearly four weeks after the start of a U.S.-backed offensive that cleared out the tens of thousands of residents still there. Government troops, supported by multiple air strikes from a U.S.-led coalition, recaptured themunicipal building, though the ultra-hardline militants still controlled a significant portion of Fallujah, an hour's drive west of Baghdad, and many streets and houses remain mined with explosives. Federal police raised the Iraqi state flag above the government building and continued pursuing insurgents, according to a military statement. Hours later, a coalition spokesman said the advance was confirmed. Prime Minister Haider al-Abadi said on Twitter that he would soon declare victory in Fallujah, as government forces continued pushing into the city. Troops could be seen coming under sniper fire earlier in the day as they entered a large mosque about 100 meters (300 feet) from the municipal building. Clashes also involved gun fire, artillery and aerial bombardment, sending clouds of smoke toward the sky above the city center. Heavily armed Interior Ministry police units were advancing along Baghdad Street, the main east-west road running through the city, and commandos from the counter-terrorism service (CTS) had surrounded Fallujah hospital, the military statement said. Iraqi government forces, with air support from the U.S.-led coalition, launched the major operation to retake Fallujah on May 23. Sabah al-Numani, a CTS spokesman, said on state television that snipers were holed up inside the hospital but the facility was expected to be retaken within hours. Iraq launched a major operation on May 23 to retake Fallujah, an historic bastion of the Sunni Muslim insurgency against U.S. forces that toppled dictator Saddam Hussein, a Sunni, in 2003, and the Shi'ite-led governments that followed. The participation of Iranian-backed Shi'ite militias in the battle alongside the Iraqi army raised fears of sectarian killings, and authorities are already investigating allegations that militiamen executed dozens of Sunni men fleeing the city. Iraq's top Shi'ite cleric, Grand Ayatollah Ali al-Sistani, urged pro-government fighters in a Friday sermon not to seek revenge against residents. There were no initial signs that Shi'ite militiamen had entered the city proper. Fallujah was seen as a launchpad for recent Islamic State (IS) bombings in Baghdad, making the offensive a crucial part of the government's campaign to improve security in the capital. U.S. allies would prefer to concentrate on Islamic State-held Mosul, Iraq's second largest city located in the far north of the country. Islamic State has begun allowing thousands of civilians trapped in central Fallujah to escape and the sudden exodus has overwhelmed displacement camps already filled beyond capacity. More than 6,000 families left on Thursday alone, according to Fallujah Mayor Issa al-Issawi, who fled following the IS seizure of city in January 2014. "We don't know how to deal with this large number of civilians," he told Reuters on Friday. The number of displaced people surpassed 68,000, according to the United Nations, which recently estimated Fallujah's population at 90,000, only about a third of the total in 2010. The United Nations says over 68,000 people have been displaced by the fighting in Fallujah. The Norwegian Refugee Council (NRC), which has been providing aid to displaced people, said escapees reported a sudden retreat of IS fighters at key checkpoints inside Fallujah that had allowed civilians to leave. "Aid services in the camps were already overstretched and this development will push us all to the limit," said NRC country director Nasr Muflahi. Islamic State, which by U.S. estimates has been ousted from almost half of the territory it seized when Iraqi forces partially collapsed in 2014, has used residents as human shields to slow the military's advance and help avoid air strikes.